IGN Comics: Are there any plans for you to write Wonder Woman down the road? Pfeifer: It'd be interesting. I might actually be doing an issue or two that sort of ties in with Amazons Attack. I'm not quite sure when they'll be scheduled, but there have been some talks. These series are so tightly tied that maybe I'll take a crack at it. I'm not sure how that affects Jodi's schedule. I'm certainly not replacing her on the book, but there's been some talk of maybe me doing an issue or two. That'd be fun. It's certainly a high profile book, and a DC book that has been appearing since the early forties. It's always fun to take on those iconic characters. Seeing as the nu52 version of these events has just been posted, I felt it would be relevant to show how they originally transpired to clarify some details concerning them. No new content after this line! About 8.5 pages out of 26. From the really fun graphic novel by Paul Dini and Joe Quinones that I wish was an ongoing series. So I was thumbing through my New Gods collection and felt that more of its epicness could be spread around. 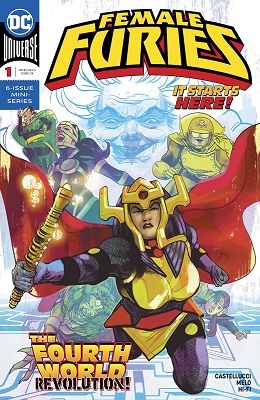 Amanda Waller VS Granny Goodness!